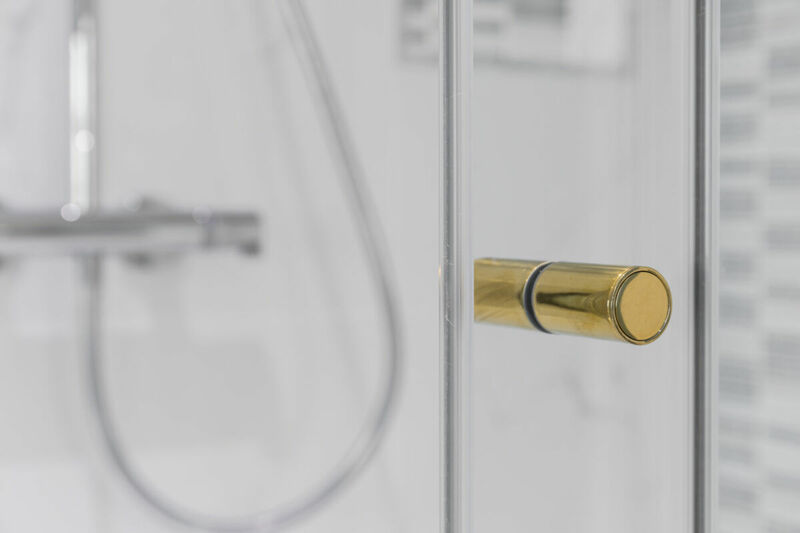 Bathroom Eleven, bathroom showroom and Matki stockist based in Surrey have a reputation for creating design-lead, curated bathrooms. Using the most luxurious fitting and fixtures, designers at Bathroom Eleven have created this high-end family bathroom within a period property in Surbiton. Flowing beautifully in function, style and finish, the space is a shining example of classic bathroom design with character. The Matki-ONE Slider Shower Enclosure for Corner was specified with Architectural Bronze framing and Brass circular disc detailing. Bringing together the cool blue tiling, Chrome and mix of warm finishes adds interest and a unique edge. The brief was to achieve a bright and airy space that was in keeping with the age of the property. A five bedroomed home in Surbiton. The space had to be elegant and classic and with a good sense of space using detail to highlight key areas of the bathroom and give the sense of luxury. Matki offered the perfect enclosure that fit with the spacious requirement for the bathroom without having to use a cumbersome frame. The slight strong frame added another level of detail which neatly highlighted the slim rectangular shapes of the mosaic tiles. From a practical point of view, the sliding door elegantly glides across the minimal frame emphasizing the quality of the structure and moving parts built into the product which fit with the high specification of the bathroom. 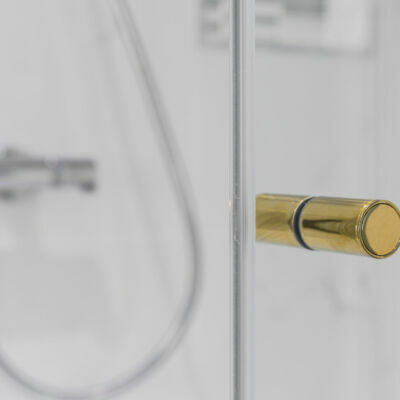 Bathroom Eleven provide the full Bathroom design service covering Design, Supply and Installation – and most importantly Inspiration, including moodboards, blogs and 3D plans at their website. This project was featured in Ideal Home November 2018 issue, pick up a copy to learn more about the design process.